I’m sure there is are equal portions of the fanbase vehemently against Briere returning along with those ready to welcome him with open arms. I’d assume many would interpret an offer to Briere as some sort of backtracking on 2007 or even as an attempt to recapture the magic lost from that thrilling pair of playoff runs. I think that’s a little bit of a stretch. Even if you’ve never seen a single move by Darcy Regier as a wise one, you have to realize that no NHL GM would operate on the basis of trying to re-live the past. Were talking about a player who was under 30 when he left and will be signing an over-35 contract no matter where he goes. Signing Briere wouldn’t represent a decision to acquire a cornerstone player which would accelerate the rebuilding process that Darcy Regier is attempting to build. He’s not in the same boat as Nathan Horton or David Clarkson (although signing Briere wouldn’t limit the Sabres from chasing those two). 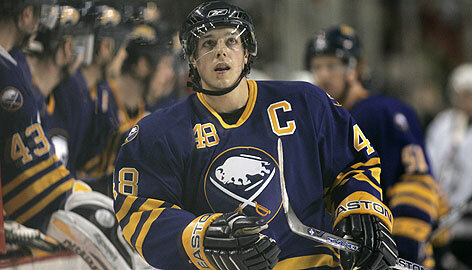 What Briere does represent is a veteran talent who can still contribute at a respectable level. Coming at a discounted rate and adding some consistent firepower to the right side are also welcome benefits. Plenty was said about Briere’s leadership abilities in the Buffalo locker room prior to his departure. Plenty more has been said about the mental make up of the current team and the impact stand-up vets like Steve Ott have had on the core after such a short period of time in Buffalo. Bringing back Briere’s intangibles wouldn’t be a waste, especially on a team that lost its captain at the deadline and may just lose two more elder statesmen before the draft next week. Intangibles aren’t everything, of course. Every team needs goal scorers too. But I’m confident that Briere would be an excellent addition to the leadership dynamic in the locker room. If he’s coming here at a price lower than $3.5 million it is a win on two levels. The one true question that needs to be asked when exploring signing Briere is whether or not he can help the Sabres improve. I stated above that he will not be the equivalent of a major free agent signing (much like what he represented in 2007) but that doesn’t mean he wouldn’t be effective. Obviously Briere is not the 32-goal, 95-point man that earned that whale of a contract from Ed Snider. From watching him play the last couple of years he still showed some offensive flair and I feel that in the right situation that he would be able to contribute. In addition, he would make for a solid addition as what I’d assume to be the second line right wing role heading into next season. Perhaps reuniting him with Ville Leino would allow the pair to recapture the magic that put Leino on the map just two years ago. I could also see Briere having a very nice impact on a certain young Russian center – both on and off the ice. The crux of my point is that with the type of leadership that was on display his first time around combined with adequate offensive production would serve as a nice bridge for a rebuilding squad. Basically I see the benefit of bringing in a player like Briere based on the idea that if he can help the team and contribute it won’t be a bad signing. He’s got talent around the net. I could see him (and a couple other additions, hopefully!) helping out the powerplay. I think he would like to come back to Buffalo; he has said so in the past. My only reservation with bringing him back is that he oft injured. Other then that reservation, bring him back would be a win/win situation for him and the team. The injury issue is actually the one thing that gives me the most reservations about considering him as a FA prospect.